Carte de la Mer du Sud ou Mer Pacifique Entre l'Equateur et le 39 1.2 de Latitude Septentrionale. 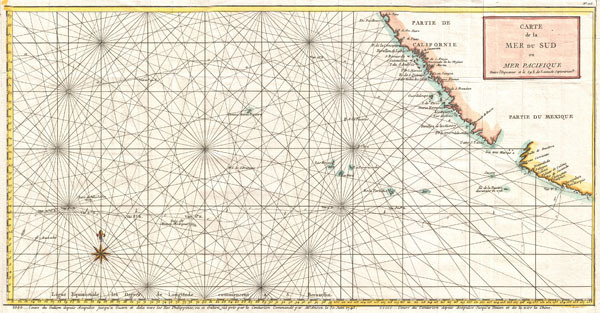 This is a rare 1750 nautical chart of the Pacific Ocean by the French map publisher N. Bellin. Based on a similar chart in English prepared two years earlier by Seale. Chart depicts the trade routes used by Spanish Galleons from Acapulco, Mexico heading towards Manila in the Philippines. In particular, this chart depicts the travels of the Spanish Nostra Seigniora de Cabadonga and the British Navy Commodore George Anson. Anson lead an ill-equipped expedition into the Pacific with the mission to attack Spanish dominions in South America. Though he failed in this mission, Anson did succeed in capturing the Spanish treasure galleon off Cape Espiritu Santo on June 20, 1743. The Spanish galleon was loaded with gold, silver and, more importantly, nautical charts depicting the trade routes used by Spanish Galleons between Mexico and Manila for the previous 200 years. This significant discovery allowed the British to disrupt Spain's trade in the Pacific and thus economically handicap the Spanish dominance of the New World. Following his capture of the Nostra its treasures were paraded through the streets of London in no less than 32 wagons. Anson was hailed as a national hero. Beautifully details the pacific islands and much of the Mexican and California coast. Names numerous important destinations along the California coast including Cabo San Lucas, San Diego, and Acapulco. Rhumb lines throughout. Drawn by Bellin and published as a supplement to the 1850 French edition of Anson's book A Voyage Round The World, In the Years MDCCXL, I, II, III, IV. Anson, G., Voyage Autour du Monde, Fait Dans Les anees 1740, 41, 42, 43, & 44., 1750 Paris Edition. Mercator's World, Nov/Dec 1998, p. 44.